HTTP Error 500.19 - Internal Server Error. Error Code	0x8007000d . When Creating a new website or converting a virtual directory to application. HTTP Error 500.19 - Internal Server Error. Error Code 0x8007000d . When Creating a new website or converting a virtual directory to application. 2. Delete this file . 5. Now restart your website from IIS manager and it will work . Web Application inside a virtual directory refers web.Config of parent directory and error related to that configuration file encountered . You have to insert the <location> tag as mentioned above in the parent web.Config . 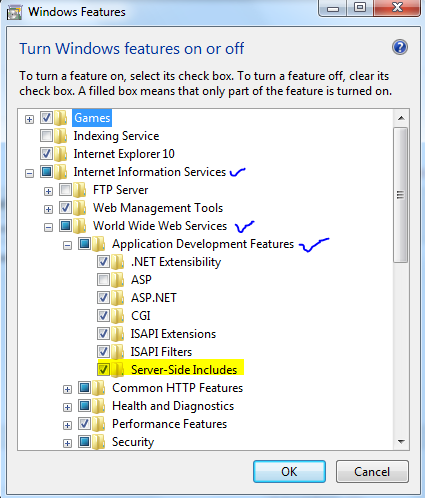 Step 4 : Check the option Server-Side Includes under the Internet Information Services , please check the image for reference . Step 5 : You are good to go , click ok and use your Server Side Includes ( SSI ) codes in html files and host under IIS Web Server . Thanks ! How to configure IIS to use a specific IP in Multi IP configuration server . There can be times when you want to run apache and IIS simultaneously on your single Server and also on port 80 , in that case the only option is to get an extra ip allotted to your machine and assign each one of them to each server . The process to do this is ( i suppose that IIS 7 is currently working and serving a ASP.NET website ) install php from microsoft web platfom installer ( you can get that here - http://www.microsoft.com/web/downloads/platform.aspx ) it will automatically install the dependencies . Now simply add a new website in IIS with default app pool and your site is up and running with php installed . Recently i found out that my site was captured under a different domain name . When i was searching for some link in google there was a link which was pointing to my website's page but the domain name was entirely different from mine . I checked in my server that IIS was bound to all HTTP request coming through port 80 to my site hence someone just used my ip address under their domain name and started publishing my site under it . Solution to this problem is simple, bind your website in IIS to specific domain and never leave domain binding empty else you could also face the same problem . The solution i found for this problem is on this blog post . On the node with your computer name, select "Application Pools"
Click "Classic .NET AppPool" and select "Advanced Settings..."
Select "Identity" property and change its value to "LocalSystem"